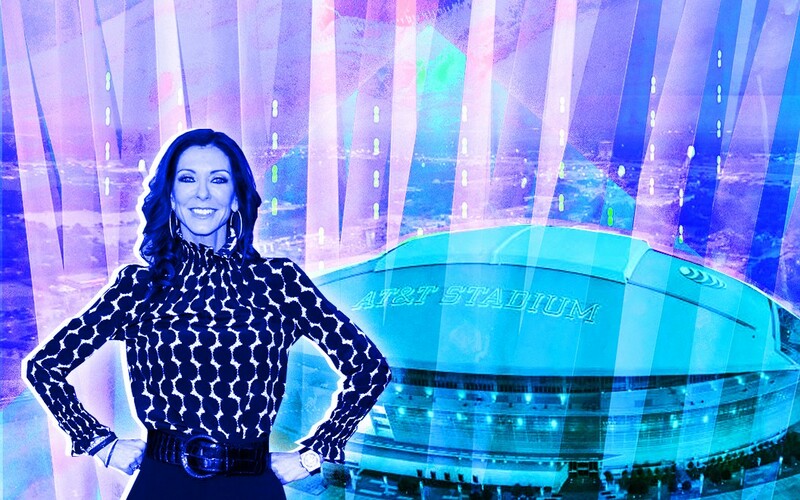 Charlotte Jones Anderson, CBO of the Dallas Cowboys, sits down with IoT For All to discuss the Cowboys’ partnership with AT&T and how the implementation of 5G will enable them to create an unforgettable fan experience. Just last month AT&T announced that 5G was coming to AT&T Stadium, and as of last week they’ve gone live with Mobile 5G in part of the stadium. Fans will now be able to experience 5G at events held at the stadium, including this fall when the Dallas Cowboys take the field. This is only the start of what is sure to be a surge of news about 5G launches in other professional sports venues in the near future. Of course, this is super interesting to us as an IoT publication. It’s also interesting to me on a personal level, as a huge football fan who loves technology, so naturally the combination of the two topics is something I’m extremely eager to discuss. Who better better to discuss that convergence of football and technology with than the Chief Brand Officer (CBO) of the Dallas Cowboys, Charlotte Jones Anderson. I’m not sure whether I can dive into this interview without letting you know that Mrs. Anderson was one of the nicest and most pleasant people with whom I’ve ever had the opportunity of speaking. So, after exchanging some warm banter, we got right into a great conversation about the Dallas Cowboys’ efforts to stay on the forefront of technology with every initiative they take as an organization, particularly relating to AT&T stadium and the fan experience they’re looking to create. The entirety of my conversation is below, and I promise it is well worth a read! Charlotte Jones Anderson: Well, let me start off by saying that we’re excited about this new frontier, which is probably the most appropriate way to put it. Ryan Chacon: As are we! We think the capabilities of 5G will be quite impressive, and I’m super excited to hear more details on what you all have planned when it comes to 5G and the connected fan experience I’ve read a bit about in the news. CJA: I’m not sure if you were able to catch John Donovan’s interview [at CES]? Because he talked a little bit about it. He had actually been at our playoff game the week before and tied in the reference to the stadium [AT&T Stadium] being the first venue and first place really to actually have 5G. It was obviously exciting to be around CES, but it was super exciting coming off all the energy in and around the game and what that actually might mean for us and for fans in general for the future. RC: Absolutely — I’d love to hear a bit more about how you all got here. It’s no secret to me how much value your organization places on technology. The 60-yard wide scree is a huge testament to the emphasis you all put on technology to take the fan experience to the next level. CJA: Sure! So, ten years ago when we built AT&T Stadium, the process that we had going into it was, of course, that we needed to build a venue that would be suitable for our game and comfortable for our fans and where they would have a great fan experience. That was sort of the baseline. But from there, we wanted to figure out how could we attract fans and people to our game that weren’t fans beyond our sport. What can we do that would entice them to want to come to actually see the game inside the venue and then maybe become fans along the way when that might not be their immediate directive or their immediate passion? We asked ourselves how we could take our game and really revolutionize the way that our fans experience sports and the way our fans experience our game, in particular. It had everything to do basic things that you might expect which is ingress and egress and restroom lines and concession lines and payment, and all of the flow and structure of the fan experience, but it also had as much to do with how we create an experience that they couldn’t get anywhere else. How could we change the way people interacted with our game without being part of that shared experience in the game? How could it be something that they couldn’t replicate anywhere else? That’s how the concept of the video board came about. No one had ever done that before. There hadn’t been a venue that able to support the kind of engineering required to launch something like this. What if you became fully immersed in the game and could actually see the emotions of the players’ eyes? That’s how the board got to be so ginormous. It became part of the experience as opposed to having you take your eyes off the experience to consume it somewhere else. That was sort of step one for us. Then it was like “Now that we have this big board, how do we keep continuing to engage people in that way?” Well, we realized that as people change their behavior and as technology advances, we need to have the infrastructure and the backbone to be able to support what would come in the future. It’s not necessarily about what we did today. We knew that on the horizon we would need to have the infrastructure necessary to take advantage of new innovations and new technologies that would come down the road. That was really the context for us reaching out to and becoming partners with AT&T. We knew that if we wanted to be on the cutting edge, we needed a partner that actually worked to advance that cutting edge and that had the vision and the focus of where the technology was headed. We relied heavily on AT&T’s vision of the future so that we could be totally immersed in what would be coming down the technological pipeline, how that would impact us, and how could we translate that into a fan experience. As we moved from 3G to 4G LTE, we were able to build capacity and the backbone necessary to accommodate what then was a little interaction but which became moving 8–10 terabytes of data, video and content during a three-hour game. The type of infrastructure that’s built just for AT&T stadium is crazy when you think about 80–100k people all in one place. We have the same infrastructure as some small cities just within the stadium. For us, the next logical step with AT&T was 5G. That’s how we jointly took this step. We need to be 5G-ready even if we don’t have the handheld devices right now to take advantage of 5G, but we need to be ready when it does. The idea is to be 5G-ready and say, “Okay, now we’re ready to implement virtual reality, augmented reality all of the things we see in the future in real time at game time. For example, one of our early technologies was being able to take a 360-degree view, using cameras that were all around the red zone area, enabling a 360 view of a play actually being executed. The challenge was about whether you could actually see that in real-time. How much time did it actually take the video feeds to get from the cameras to the fans? That time delay in a real-time game is a challenge. We would have to wait until the next pause in action to be able to show the action to the fan. Now, with 5G infrastructure, we can do things like that in real-time. We can bring the fans right into the real-time experience. As we get into more advanced technologies like VR and AR, one day we can hopefully be in Dak Prescott’s shoes at the snap of the ball and be seeing all the action in real-time. That technology unavailable to us right now, but our infrastructural backbone will be ready for when the technology is ready, enabling us to implement solutions immediately. Our biggest competition is the home screen theater. In that comfortable environment, you have the biggest screen you can, you’re totally immersed in it, it’s an inexpensive seat and you can share that experience with your friends easily. However, the greatest thing about watching the game on television — I had a network CEO tell me this — is wishing you were at the game. For our fan that’s actually there, they want to share that unique experience with their friends that aren’t there. As we look at the course of the game, how do we provide that unique experience that’s different from another game, or different from watching it on television and be the outlier in the space and in the industry? partnering with AT&T to build this type of infrastructure, to invest in it, and make that a priority is what will keep us on the cutting edge. There’s a level of convenience that fans expect.They want things faster, quicker, more conveniently and with less hassle. All of those are basic expectations that keep growing every year. For example: “How short is the line?”, “Is it easy to get in?”, “Where is the open parking space?”. We certainly plan to cover all of those expectations. We want to ask, what is the experience they haven’t imagined yet? That was really the driver behind the stadium. What is something that we can create that’s beyond their wildest imagination and how can we deliver it to them? As we sit in a conference room talking about whether we should make this venue 5G, the answer is immediately “yes, of course.” We need to be on the forefront because we want to be able to create and take advantage of new things that come up. Without the infrastructure, however, we can’t make that happen. RC: I completely agree. The last thing you want is for your ideas to be stalled because your infrastructure can’t support it. RC: Getting to the forefront of innovation means getting 5G in there before, let’s say, you deploy AR/VR, or any of these new fan experience-enhancing technologies. You need 5G in place, otherwise, you’re going to put out a subpar experience that won’t deliver the impact you want. Playing catch up is definitely not what you’re all about, so I understand completely. CJA: Yes, we don’t like the catch up mode. RC: Not at all. You have 80–100k people in there every week. Each person is capable of marketing and promoting that experience because they had a good time. One of the pains I’ve had being at stadiums is trying to share content because you’re in a very small area. Trying to get messages or Instagram posts out there is challenging and unreliable. So, if you’re able to promote that when people are most likely to be interested — while they’re watching the game at home — means they’re more likely to become interested in getting to the stadium for next week’s game. CJA: Exactly. As you know, it’s always been about the shared experience. Our game is about tradition. It’s about the grandparents taking the grandkids and father taking daughters to the game. It’s about creating an experience and a memory that’ll last forever. Memory has become something that everyone wants to share and has the ability to share in real time. How do we make sure that we have the infrastructure to be able to let them do that? Going back and looking and look at our consumer data over the course of a game, it’s interesting to see how platform usage changes. We get an increase in Snapchat when we’re in live action because everyone is videoing and it’s like right then, but when we have a break or a timeout or the whistle is blown, then people jump to Facebook or Instagram, and they color up their image and out it goes. For us to understand the rhythm of our game, how people want to share that content and then get it out, each step is really important to us. If we can’t tackle the first step, which is to have the platform to be able to get it out, then we fail before we ever even start. hat’s not an option for us. We’re ready to make sure that we have the capacity to entertain anything we want. RC: Have you all run into any problems getting 5G into the stadium with the infrastructure that was built 10 years ago? and how it’s been evolving over time. Were there any unexpected hiccups? CJA: I don’t want to say “weren’t expecting.” Now, 10 years after building the stadium out here, we’re aware that construction is a process. Every time you upgrade or change something you learn new things and the process evolves. We were very cognizant of needing to have a venue that had incredible flexibility to be able to host any kind of event that we may want to host. We also knew that we needed to have it be able to be enhanced for things that we actually weren’t sure were coming, and building the infrastructure it in such a way as to be able to do that when you know that on the front end is a lot different than retrofitting a 20-year-old stadium. We kept it top of mind from the time we started digging the hole, so in terms of actually installing and implementing, I would say it’s been relatively easy to install the 5G infrastructure and get it up and running. Here’s the other thing: we have engineers who know what they’re doing, and we have people that are willing to invest. That’s where you face a lot of the challenges across different venues, different sports and different places. You have to prioritize technology or it won’t fall into your budget. For us, that’s sort of an open-ended budget because we know it’s going to continue to evolve, and we know that we need it even though it’s expensive. RC: You need to make that investment. I mean, there are stadiums around the country that within 20 years of being built are outdated because the owners didn’t think about future-proofing the infrastructure, so they basically have to rebuild them. That’s kind of what we’re experiencing here. We’re right outside of DC, so you know FedEx field, for instance, which is 22 years old. It’s nothing compared to any of these new stadium being built in Atlanta, or what you all built, or what’s going up in Vegas or California. Everyone needs to think about the issue in the way that you are. Your framework allows you to have longevity in that big investment and to keep it relevant for your fans to keep increasing the experience they have and kind of blowing their mind every time they come in to see a game. CJA: You know, it’s a bit like Keeping Up With the Joneses what we’ve experienced as we continue to raise our own bar so that we offer a great experience, and our fans come back and they want it even better. We love that they honor and appreciate it — that they want more it even more. Our challenge is always to figure out how we should implement the “more” and how we can ensure that it’s absolutely the best it can be. And that doesn’t always mean that it’s perfect, as we know, but every day we’re working to try to figure out how we can make it bigger, better, more immersive, cooler and more unique. That’s our daily challenge. Fortunately, we thrive in that,and we have a partner [AT&T] who not only thrives in it but sees it and can help us imagine things that we otherwise wouldn’t have. Hannah White (IoT For All, Managing Editor): You touched on collecting data from the platforms the fans are using a little bit earlier. I was wondering whether you could expand on the different types of data you’ll be collecting as the stadium becomes more connected. How do you see that shaping or like transforming the fan experience? CJA: There are good and bad things about data. You can have big data to have big data and you get lost in it, or you can use the data to refine and hone your offerings. Experience makes it more convenient, more comfortable and more individual. I think that’s actually the value of analyzing data. Think about our audience. Let’s say we got 90,000 people into the stadium. It’s almost as challenging as picking the right piece of music to play because you have 90,000 different preferences on what music, food, content and applications that they like. Now, we can’t dive down into each individual person and customize that experience individually for 90,000 people simultaneously, but we can get closer. That’s really our goal: how can we improve your individual experience? Here’s the thing about the data capture. You know when you have a strong season ticket base. If people exchange, sell, move, or give away their tickets. In those cases, the person sitting in that seat is no longer the person whose data you’ve collected. So that becomes a different experience for that person, and it could be on game day that you know about such a change. So, if I’m then having to show information that that season ticket holder already knew but now it’s a new person in that seat, then they’re actually unfamiliar, and now I need to provide that person the information that they need as well as the season ticket holder who already knows that information. The goal is to listen to the fan who’s actually there. That’s where we’re trying to get with the data that we actually gather in the first place. And all of that evolves enormously. For us, season to season is a huge change in how we can actually customize an experience with the data that we have, but even game to game, and even within the game is where we aim to address that. This can involve anything from as simple as “can we give that fan information like which restroom line is shorter” right now — that’s the kind of granularity that 5G will enable us to offer. So I don’t know if that answers your question, but I’m trying to speak to more of the purpose behind why we try to collect data and what we offer through it that will most satisfy the fans we have in the venue at that particular time. HW: Do you see yourselves leveraging any of this data on the individual and transferring it to an in-home experience if for example, it’s an away game, or if the fan couldn’t make it to the stadium that day? Do you see any type of bridge between that in the future, or are you not focused on that at the moment? CJA: I think we certainly see the bridge into the future. I think you can give that particular fan the information they want. They may want more information on a specific player than fan X. If you customize the content that you produce to the individual, I certainly think that’s where we’re going in the future. Today, we do that probably in broader buckets, to be able to give that type of customized content, and we know enough to know that the different types of likes and dislikes from the people that consume our current content, so we try to target those buckets. I see for the future those buckets getting smaller and smaller and smaller and smaller and more massive in the numbers of buckets that we have. HW: Definitely, one of the trends we actually saw at CES was as brands can collect more personalized data on their individual users or fans, they begin to build more personalized relationships. So it sounds like that’s what you’re moving towards as well. CJA: Well I think so for sure. And especially for us because I don’t really like to consider ourselves a brand. We are more like a lifestyle or a culture. We enjoy such great fan avidity that we’re more like an aspiration. We aren’t something that someone can really own. Like you can’t own Notre Dame. It’s a connection, it’s a culture, it’s a feeling, it’s an atmosphere. It’s something that people can share so they’re much more emotional about their experience with us. Now, we try to connect that emotion to other brands and partners so they share that same kind of avidity and passion. And we think we do that very well with the partners that we have, but we also know that our direct relationship with our fans is incredibly special and unique to each one. So we try to make sure we honor and respect that and appreciate the authenticity of that connection. RC: Yeah that’s great. As a fan of sports myself, I think that it’d be much more impactful if things were a bit more tailored towards the individual. I know that we’re probably running out of time here so I don’t want to take up too much of it, but I have one last question. I know this may be a bit private for the organization, but what does the rollout plan look like for you guys as far as technologies like AR, VR, other connected experience-enhancing platforms? Do you guys have any details on the rollout plan over the next 12–24 months, or is that information private? CJA: We’re not actually ready to announce exactly what we’re doing in each of those spaces, and I’ll tell you why. It’s because each of them actually comes with their own technological challenges: not creative challenges, but implementation challenges. In that space, what I would probably say more generally is that our venue will be 5G-capable by the start of the season. Now, as you and I both know, not all fans will have 5G capability on their devices. What will they be able to see and experience because of 5G at the start of the season? What we know is that connection, speed, ease, and capacity will all be better. The usage of creative technologies like augmented reality and virtual reality and those experiences, we are set and capable to hold, handle, and execute. However, those technologies themselves and how they are shown and played in the stadium, as well as the partners required to actually implement them in games, are not at the same readiness that our installation of 5G is. RC: Absolutely. It’s just like any type of content creation. I mean you’re doing it at such a sophisticated and in-depth, detailed level that it’s not going to happen overnight. Testing really comes into play, the technology has to be as sophisticated as you need it to be to give that experience. There’s no reason you have to settle for anything less. But once you have the 5G infrastructure in place, then you can start going down those paths for the different technologies and different experiences you want to create and perfect it so each fan has that experience you wanted to create. CJA: Exactly. If you think about it, we’ve done some things at camp with augmented reality. You can basically be standing by Coach Garrett on the sideline and look to your left and see Zeke and look to your right and see Dak, and you have that experience with a headset. Right? Sitting in the stands with a headset by August is probably not going to be the most effective implementation of 5G for us. It’s not quite where it needs to be from how a fan could actually use it and experience it. What would be great is if you were to be sitting in your seat and you are looking up at the big board during the snap of the play, and you’re looking at the play in real time through the eyes of Dak Prescott. Right? Now that’s a cool experience. RC: Absolutely. When 5G really takes off — not just in the Stadium but also at home — how do you think these technologies are going to be used to create at-home experiences? I’ve heard many things in the past saying it’s getting to the point where you don’t even need to go to the game because you’re going to be able to put a headset on and watch the game as if you were there. Now, do you think that’s realistic? Because I don’t think you can fully replicate the experience of being at a stadium, but these technologies are going to enable you to be able to get you closer to that experience without having to go anywhere. CJA: Yeah. I think it will certainly get you close to that experience. Let’s take you from sitting in front of your home theater. You used to sit in front of a tiny screen, and then it got bigger and bigger, all of a sudden it was 50 inches. Then it was 60 inches and now it’s a huge home theater with surround sound and the works. You’re close to replicating that experience in the game, but you’re not surrounded by 70,000 people in the Mercedes dome and it’s so loud that your water bottle is shaking and you’re feeling it and you can touch the people next to you and hug total strangers and you’re all excited and all that. You can’t replicate that at home. I don’t care how good you’re augmented reality is. That part will never go away. That’s why it doesn’t actually threaten our in-game experience; it enhances our in-game experience. And if nothing more, you’re sitting there and getting as close as you can to being there, and you’re thinking, “Wow, if I were really there, then I would be high fiving all of these people that are here, instead of virtually trying to touch them.” It’s more hype to go, “Now I really want to be sitting in that seat.” It’s just like how the effects of movies have gotten you immersed in the feeling of the movie. With 5G, all of these other technologies will get you closer and closer to that real experience, but nothing’s ever going to replicate the real thing. And just as the away experience continues to evolve, then so too will the endgame experience. 5G is in the stadium but not in your house. Whatever I can do with that 5G within my stadium makes the stadium experience even more different than sitting in your house. RC: Absolutely, that’s great. It all makes complete sense, and I think it’s really fascinating what you guys are doing. I’m really excited to see how it rolls out. I’ve never been down to the stadium, but once you guys get 5G in there and start putting these immersive experiences within the stadium, it definitely becomes more than just going to a game. It’s a full trip and experience for anyone who visits. CJA: I’ll tell you this, and I ask this to both of you because I have no idea what your age range is and in my own home I have a petri dish of what people like at different age levels. My youngest child is 17 and my eldest is 25, and they’re vastly different in terms of what they value and yet they’re only seven years apart, right? What I may value as a cool, new engaging experience is going to be totally different from what you might value or what my young son might value. So for you, as a sports fan, what do you think is the coolest thing it could do for your experience? RC: I think overall from a technology standpoint there are a lot of things you mentioned that are just convenience factors that will definitely improve. So, making the trip into and out of the stadium as easy as possible is a deal for a lot of people, because they don’t want to deal with getting into and out of the stadium. They leave before the game is over, and they don’t want to come to the game, so that’s a big part of it. I do personally like the ability to amplify the viewing experience in some capacity because as great as these stadiums are, not every seat is as easy to see for individuals, and for me, the more I can see and the more I can feel like I am somehow in the action the better. So those two things are really interesting for me. HW: I think I would be most interested to see live augmented reality transitions. I know, at least when watching on TV you get a lot of overlays with the player and lines on the field, and I think that would be really interesting to do live at the game. I’m not sure what type of technology you would need to be able to handle that, but that would be a really interesting immersive experience. That’s a little bit beyond just fans flowing through the stadium, it sets your stadium apart a little bit more. RC: A lot of people I’ve recently started to watch football with are not very familiar with how football actually works, so if you had something you could put on while you watch the game that explains what’s happening, such as what the first down line means. I know you don’t see that at the game, you only see that at home, but maybe I could put a headset on and see that first down, so then all I have to be explained is the ball has to get past that line. Or what does the blue line or scrimmage line mean? And have that be something you can actually experience. Because there’s a lot of people I know who don’t really understand a lot of the details of football, so half the game I’m being asked questions, and if there was a way that you can put a “football for beginners” headset on, and somebody could be commentating around the basics of what’s happening, that could be a really neat thing to grow people into fans that otherwise may have avoided it because of the learning curve. CJA: That’s interesting you say that, and I don’t know how much you listen or watch, but Tony Romo is a broadcaster now for CBS. RC: I think he’s one of the best broadcasters. RC: I’m sure every fan base has that unique voice and unique personality they can relate to just by being a fan of their team. If you could get to be the voice as you see the overlays of the first down, line of scrimmage, different numbers, and somebody is explaining what is happening even at the most fundamental level, and they eventually graduate to the point where they can listen to Tony Romo commentate on a game and appreciate what he’s saying and why it’s so unique and special and the take he has versus these commentators that have been around forever and are just kind of talking very high level and not really explaining too much. CJA: Yeah, exactly. So I have one last question — it’s a would you or wouldn’t you. You said you’d put a headset on, and we’ll all put earphones in, but would you put augmented reality goggles on your face? It’s like when you had to wear 3D glasses back when there were 3D movies. Would you put that on in a game? RC: I think it would really depend on where I’m sitting. Personally, I’d probably say no because I just want to be able to watch the games. When I go to baseball stadiums, for example, I’ll sit behind home plate, further up if I have to, just so I can see the whole play evolve and the game happen. I think it’s a unique experience if you’re sitting far away and can’t see very well, but if you want different angles and a different viewing experience, maybe that would be a value-add for them. I think it’s a personal preference. HW: I think it would be a huge value-add for children attending the game, actually — children that can’t see very well. I went to a lot of college football games growing up and I don’t think I understood it until I was 15. When they’re younger, giving them something that could be like a Cowboys-based virtual experience for kids. RC: So, they watch the game, and it’s somehow geared toward the kids so they can learn to appreciate and understand it. I think it depends on a lot of different factors. When I go to the movies and put on 3D glasses, that’s not the most comfortable experience to watch a movie. At that point, I’d rather just watch the movie normally. Or, when Google Glass came out, everyone was so obsessed with this idea, but I never thought that people would just walk around with these things on their face, which they really never did. CJA: Yeah, three hours into a game with this stuff hanging on your face, probably not. That’s why I’m talking about how when technology catches up to the actual comfort and experience of the fan, that’s when you’re going to see it. Right now, we could do it. You could have these huge, ginormous contraptions that you put on your face. And you know what? They’re going to put them on for a couple of minutes, and they’re going to be tired of it. That’s going to be a “wow factor,” but it’s not going to be implemented successfully. But that’ll evolve. We’ll get there, but the big question is when are we going to get there, will “there” actually be comfortable and really enhance the experience, or will it detract from it? RC: Anyone doing it too early is really doing it for publicity purposes, just to say, “Our stadium has this.” But what’s really going to make a difference is when it’s just as easy as putting a pair of sunglasses on or even when they do contact lenses. HW: Or when you don’t even have to put glasses on. RC: Right, something that you can easily switch between that augmented view and the normal view depending on if you want to watch a replay or it’s in between quarters. I think you’re right. It really comes down to a combination of that comfort and the level of technological sophistication required to create that balanced experience. Otherwise, I think you’re not going to get the adoption, and you’re not going create the experience that you envisioned because it’s not going to be comfortable, and it’s not going be a sufficiently sophisticated experience that they really understand the value. CJA: Right. It’s fascinating, isn’t it!? RC: It definitely is! Thanks again for taking the time to connect with us today! I look forward to us catching up again soon! CJA: Absolutely. Enjoyed speaking with you! This article was originally published by IoT For All on February 15h, 2019.